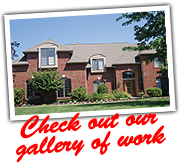 As Westlake Ohio's leading roofing contractor, Second To None Roofing Inc., is your best choice for roofing, gutters, siding and replacement windows. With nearly two decades of combined experience, we are committed to Westlake Ohio and to getting the job right the first time. Because we only use the best materials and supply superior workmanship, you can be assured that will give you the best job at a reasonable cost. In the nearly two decades of experience, our companies have completed more than 5000 roofing contracts. We are the go-to contractors for storm damage, including repairing and redoing roofs done by out-of-town storm chasers. We'll do it right the first time, and will still be here if any issues occur during your warranty.